Mid-December of 2014 saw severe monsoon along the east coast of peninsular Malaysia, with crippling floods and landslides tearing into the forest, palm oil plantations, farms, villages, towns and cities. Banks, schools, hospitals and public utility centers did not escape the flood’s reach. Within weeks, other states in the south and west were affected, but none as severe as Kelantan, Terengganu and Pahang. In less than a month and after the second wave of raging floods, over 200,000 people were displaced and 21 lives were lost. Many sought refuge in government-prepared temporary evacuation centers. Malaysians described it as the worst flood to hit the country in the past two decades. Government resources are stretched; it lacks manpower due to the severity of the natural disaster. The situation is exacerbated by an inefficient inter-state coordination for relief. The public uproar forced the Malaysian Prime Minister Najib Razak to cancel his holiday in the United States, and he returned home to make public appearances in some flood-affected communities. Unsung heroes, mostly young Malaysians, rushed to mobilize aid and volunteers. The coordination was jumpstarted by two young women with the invaluable support of a Kuala Lumpur-based soup kitchen program called “Dapur Jalanan“. In an exclusive interview with Global Voices, Tan Sze Ming, 27, and Hazwany Jamaluddin, 26, shared their experience in coordinating relief. Global Voices (GV): Take us through the initial stage of the mobilization. Tan: Firstly I was thinking of visiting a friend’s house only because his parent was alone there during the flood. After that Nany suggested we should revive again the gotong royong (community work). So I started to talk to Dapur Jalanan friends. We started planning among four people. After some discussion, we thought that gotong royong was out of our capacity. So friends from Dapur suggested we go masak (cook). From that concept, we started to mobilise. Jamaluddin: I need to add one more thing, at that point IMARET (a relief team of the Islamic Medical Association of Malaysia) discovered our initiative and collaboration with Dapur Jalanan, and our team was strengthened. A group of us were planning and organizing between ourselves on how to revive the gotong royong initiative. In the discussion, we identified local contacts in Kemaman and Kuantan. A few days after, the first poster was uploaded in the social media and blogs. Many networks shared publicly which then reached two locals in Kubang Kerian, Kelantan. GV: Was it challenging to mobilise volunteers and supplies? If yes what are those challenges? Tan: (Recruiting) volunteers was OK. When the posters were up on social media, immediately a lot of (people) especially students came to join us. 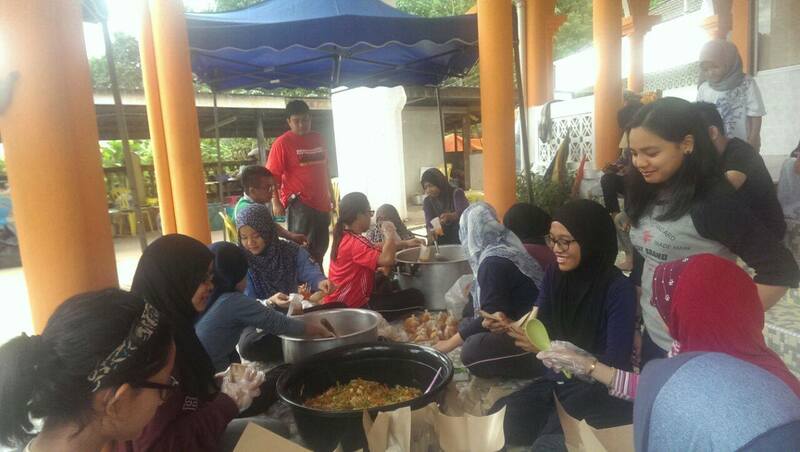 Overall we have around 40 registered in the volunteer list, but twenty-one manage to follow us to Kelantan. Supplies, yes, very challenging I can say. Jamaluddin: Challenge in identifying types of supplies that were most needed by flood victims. the quantity for required donations, and the planning for delivery to the flood victims. GV: What were the needs and concerns of the flood victims that your group identified? Tan: They needed hot nutritional food and clean drinking water. From my observations, morale was quite high among some. They accepted about what happened (flooding) but sadly the government didn’t take immediate action to help them. Jamaluddin: We didn’t expect this flood to happen. That’s why I believe, state or federal governments or NGOs are having a tough time to immediately meet the needs of the flood victims. People were concerned about lost documents, lost property, and medical coverage. For families that have children, parents said they had to start from zero because they lost everything during the flood. Issues faced by elders and children in the village focused on health care, children facing problems to go back to school, and elders with disabilities are having a tough time adjusting (in the) post flood situation. People with farms lost crops and livestocks. Also very limited access (to) clean water. The water was muddied. Also there was no place for people to throw away their waste. GV: Tan, tell me where is the group now and what are your future plans to reach out to the flood victims? Tan: They are in Kampung Kandek, Dabong. It is in Kuala Krai constituency. We don’t have any future plans so far but planning for a post mortem and further discussion on this. We’re constantly consulting one another. I think there’s a need to instill a proactive spirit of volunteerism, via a mentor system. To keep in touch every time, for outreach activities and for empowerment. And sharing of best practices. This can (help in) inspiring them. Presently the second group of young relief workers are in Kuala Krai, providing nutritional food and recovery services to displaced rural communities. Young people are often seen as the leaders of tomorrow; but often in times of natural disasters, they become the leaders of today. This post was originally written by Zashnain Zainal, on Global Voice.